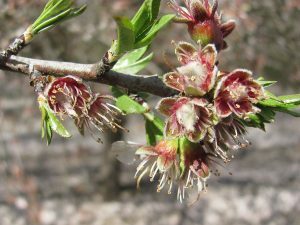 Bloom progression moved slowly over the weekend due to cooler temperatures and thunderstorms throughout the state. Additional rainfall resulted from stormy conditions in all areas on Friday and Saturday. Totals reported from the series of storms were as much as .5” to .75” in the south, .25” in the central region and .4” in the north. Isolated hailstorms were reported in the central and southern regions on Saturday. 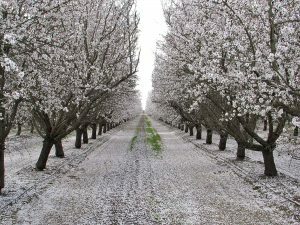 Due to these conditions, two to three hours of poor pollination were reported throughout the state on both Friday and Saturday. and provided good pollination activity on Sunday. The northern and central regions reported 4 to 6 hours of good bee activity on Sunday. In areas of the southern region, patchy fog and trace amounts of rain resulted in anywhere from 2 to 5 hours of good activity. Petal fall increased rapidly from the weekend storms. 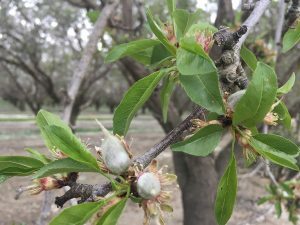 As seen in one the photos accompanying today’s report, trace amounts of Sonora and Peerless nutlets can be found broken free from their protective jackets. 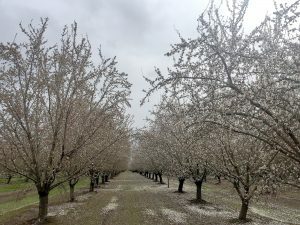 Except for the Butte and Padre varieties in the southern region, all varieties have reached peak bloom throughout the state and continue to progress into the petal fall and jacket stages. Cold temperatures over the past couple weeks slowed the process of the nutlets sizing and breaking through their jackets. 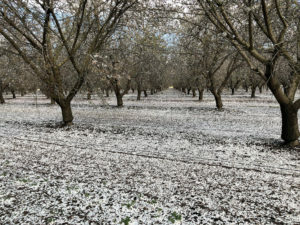 With additional rain forecast for the end of this week, growers are preparing for another round of fungicide applications to help prevent bloom disease. Additionally, many growers are beginning to apply fertilizer to support their developing crop.